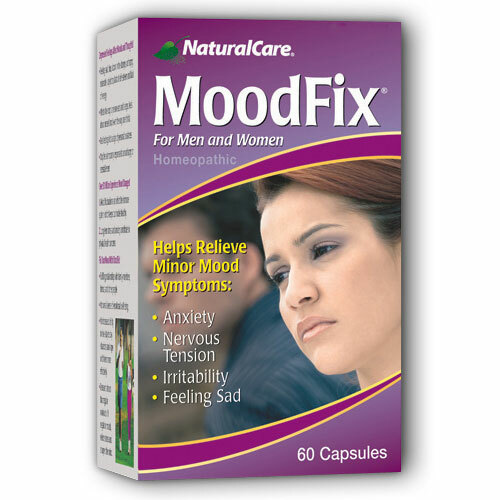 MoodFix helps relieve mood concerns which are manifested in many ways including depressed feeling, anxiety, nervous tension and irritability. Begin MoodFix today to make a difference in your life, you deserve it! Moodiness and distress can affect all aspects of a person’s life. It can impact your ability to sleep, eat, work, and get along with others. It can undermine your self-esteem, self-confidence, and your ability to accomplish everyday tasks. Those who are distressed sometimes find even daily tasks to be a struggle. They get tired easily, and then believe it or not, often find it hard to get a good night’s sleep. They have decreased motivation and often lose interest in activities that they once enjoyed. You don’t have to let daily stress, minor anxiety, fear, nervous tension, and irritability put a dark, gloomy cloud over how you see yourself, the world, and the future. Undesired moods can affect thoughts, feelings, and the ability to function in everyday life. Moods can occur at any age. Although available therapies may alleviate symptoms in a great number of those treated, less than half of people with minor mood changes get the help they need. Do something for yourself today by using MoodFix. Ingredients: Active Ingredients: Aconitum napellus 30C Gelsemium sempervirens 30C Ignatia amara 30C Natrum muriaticum 30C- Nux vomica 30C Phytolacca decandrao 30C Pulsatilla 30C Rhus toxicodendron 30C Sepia 30C Other Ingredients: Chamomile powder, Cyanocobalamin, Gama Amino Butyric Acid, d-Calcium Pantothenate, DMAE Bitartrate, Gelatin, Glycerin, 5-Hydroxytriptophan, L-Theanine, L-Tyrosine, Magnesium Stearate, Motherwort, Niacinamide, Pyridoxine HCL, Riboflavin, Silica, Thiamine HCL, Titanium Dioxide. Anxiety Relief For Symptoms of Anxiety and Stress: Anxiety, Worry or Stress Apprehension Panicky Feelings Non-Addictive. No Side-Effects. No Function Impairment. No Lactose. Indications: For the symptomatic relief of occasional anxiety, fear, anguish, stress and worry associated with the ups and downs of everyday life. Anxiety Relief helps make occasional, minor anxious feelings less frequent or eliminates them altogether. It helps you feel less vulnerable to the minor annoyances that make up your daily life. And it works without side-effects, synthetic drugs, or function impairment. Anxiety For some it can be an overwhelming sense of apprehensive or uneasiness of mind. Or it can be worrisome thoughts and tension and sometimes panicky feelings about the ordinary stresses associated with everyday routine life events and activities. In any case, it is an undesirable sense of uneasiness that may be accompanied with self doubt about one’s capacity to cope with it. an Anxiety sufferer may anticipate something worst even though there is little reason to expect it. Stress Stress is a term widely used in our current fast-paced society. Often the daily demands placed in us build up and accumulate to a point where it becomes very challenging to cope. Job pressure, family arguments, financial pressures, deadlines, etc. are common examples of ‘stressors’. It can be almost anything which creates a disturbance, including something physical or emotional. The Prevalence of Anxiety Anxiety is one of the most common feelings in America today. More than 30 million people in America experience some form of anxiety each year. Women are twice as likely as men to develop panicky feelings which typically strike in young adulthood, with the median age of onset occurring at 24 years. Children and adolescents can also experience daily anxiety. Anxiety costs the U.S. billions in direct and indirect costs annually. One survey found that people experiencing panicky feelings make more trips to their health care provider than the general population. 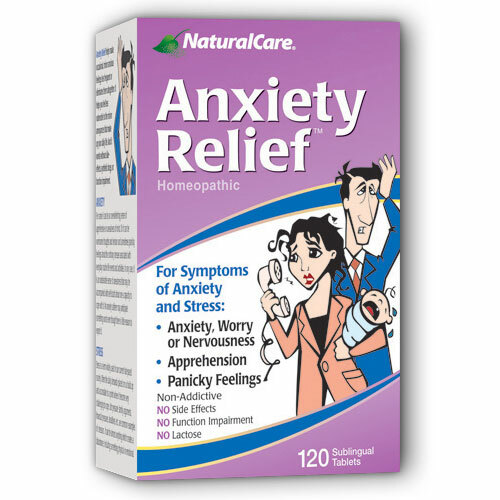 Anxiety Relief contains the highest quality, all-natural formula in strict compliance with the Homeopathic Pharmacopeia of the United States. Homeopathic medicines have demonstrated unsurpassed safety for nearly 200 years, and are safe for children, the elderly, and pregnant and nursing women. Anxiety Relief Ingredients Aconitum napellus 9x Argentum nitricum 8x Arsenicum album 8x Aurum metallicum 8x Gelsemium sempervirens 8x, 30x Hyoscyamus niger 6x, 12x Ignatia amara 6x, 12x Kali carbonicum 12x, 30x Moschus 12x Natrum muriaticum 6x, 12x, 30x Piper methysticum 3x, 6x, 12x, 30x Other Ingredients: Dextrose Directions Adults and children ages 12 and older: Dissolve 1-2 tablets under tongue 2 times daily. If experiencing anxious, "panicky feelings", safely take 1-2 tablets every 20-30 minutes until symptoms improve. Children 2-12 years of age: Dissolve 1 tablet 3 times daily, or as directed by a doctor. For best results, do not eat 10 minutes before and after dosage. Warnings If symptoms persist for over 30 days, or become more severe, ask a doctor. If pregnant or nursing, ask a doctor before use. Keep out of the reach of children. 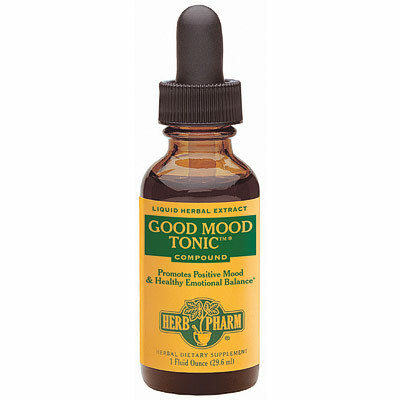 Good Mood Tonic Herb Pharm liquid herbal compounds are formulated according to traditional herbalism, modern scientific research and the fine art of herbal compounding. Our compounds are a blend of various liquid herbal extracts which are formulated to target and favorably support specific body system or health condition. Former Name: ST. JOHN’S WORT • KAVA COMPOUND Structure Function: Promotes Positive Mood & Healthy Emotional Balance Contains: Herbal Extracts of St. John’s Wort flowering tops (Hypericum perf.) Ashwagandha root (Withania somnifera) Skullcap flowering herb (Scutellaria lat.) Prickly Ash bark (Zanthoxylum c.h.) In a base of certified organic grain alcohol & distilled water. The herbs used to prepare this compound are Certified Organically Grown without the use of chemical fertilizers, pesticides or herbicides, or they are Custom Wildcrafted™ in their natural wild habitat. They are hand-harvested at their optimal potency, and are then promptly extracted while still fresh & succulent or after being carefully shade-dried. These herbs are never fumigated or irradiated. Suggested Use: SHAKE WELL BEFORE USING. Three to four times per day take 30 to 40 drops in a little water. 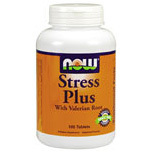 Stress Plus is an exceptional and comprehensive formula of B Vitamins, enriched with Vitamin C (as ascorbic acid) and Valerian Root. This proprietary blend is an ideal way to replenish the vital nutrients that we consistently expend on a daily basis. Essential to virtually all aspects of life including cellular energy transfer, metabolism, reproduction, digestive function, detoxification and more, B vitamins play an important role in our ability to function at the top of our game. 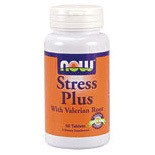 By promoting a calm attitude with just touch of valerian, NOW Stress Plus helps keep important water-soluble nutrients active in the body longer. Supplement Facts Serving Size: 1 tablet Amount Per Serving % Daily Value Vitamin C (as Ascorbic Acid) 500 mg 830% Thiamine (as Thiamine HCl) (Vitamin B-1) 30 mg 2000% Riboflavin (Vitamin B-2) 30 mg 1770% Niacin (as Niacinamide) 150 mg 750% Vitamin B-6 (as Pyridoxine HCI) 30 mg 1500% Folic Acid 400 mcg 100% Vitamin B-12 (as Cyanocobalamin) 50 mcg 830% Biotin 300 mcg 100% Pantothenic Acid (as d-Calcium Pantothenate) 150 mg 1500% Magnesium (as Magnesium Oxide) 100 mg 25% PABA 40 mg Choline (from Choline Bitartrate) 150 mg Inositol 150 mg Valerian (Valeriana officinalis) 200 mg Suggested Use: As a dietary supplement, take one Stress Plus tablet daily with a meal. Free of: sugar, salt, starch, yeast, wheat, corn, soy, milk, additives, preservatives. Other Ingredients: di-calcium phosphate, stearic acid, magnesium stearate, cellulose. Vegetarian formula. BHI Calming For the temporary relief of: Insomnia Restlessness Anxiety Symptoms of PMS Stress is a risk factor in many ailments. BHI Calming, with its all-natural blend of ingredients, helps you balance the stressful times in your life by gently relieving stress as well as insomnia. 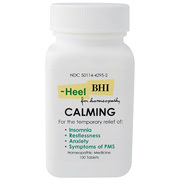 BHI Calming also helps to prevent the nervous irritability associated with PMS. Ingredients & Characteristic Symptoms: Humulus lupulus 2X Headache with dizziness; twitching muscles; sensation of insects crawling under the skin Passiflora incarnata 2X Insomnia; restless and wakeful from worryand overwork. Valeriana officinalis 2X Oversensitive; irritable; swearing mad; changeable disposition; sleeplessness. Veratrum album 4X Persistent mania with desire to tear clothes; sadness. Ignatia amara 8X Changeable disposition; laughter and sadness with tears; full of suppressed grief; convulsive twitching. Coffea cruda 10X Sleeplessness from great excitement; pains seem unbearable; fainting from sudden emotion; acute hearing. Moschus 10X Nervous trembling activity; speech confused; easily panicked. Sulphur 12X Melancholy, inclined to weep; great anxiety and apprehension in evening; sleepy during day; wakeful at night. Nux vomica 30X Bad effects from coffee, tobacco and liquor; very sleepy in evening then sleepless at night; awakens at 3 am; arises in morning unrefreshed with dull headache. 30 mg each/300 mg tablet Suggest Use: Take tablets sublingually or by dissolving completely in the mouth. Adults and Children above 6 years: For mild symptoms, take 1 tablet 3-4 times daily. One tablet may be taken as often as every 5 minutes as required for relief. Infants and Children to 6 years: 1/2 the adult dosage. Warnings: If symptoms persist or worsen, a physician should be consulted. As with any drug, if you are pregnant or nursing a baby, seek the advice of a health care professional before using this product. Store tightly closed at controlled room temperature. Protect from light and moisture. Keep this and all medicines out of the reach of children. Restful Sleep Herbal Formula Restful nights are the perfect way to wake fresh and ready to face the day. Valerian, Skullcap, Hops, Chamomile, Passionflower, Catnip and Mandarin Oil have been included to help you enjoy the peaceful slumber you deserve. Supplement Facts Serving Size: 1 Dropperful (1 mL) Amount Per Serving % Daily Value Calories 15 Servings Per Container: 30 Total Carbohydrate 2.5 g 1% Valerian ( Valeriana officinalis) (Roots) 103 mg Skull cap (Scutallaria laterifolia) (Flowering Aerials) 103 mg Hops (Humulus luputus) (Strobiles) 68 mg Chamomile (Matricaria chamomila) (Flowering Aerials) 52 mg Passionflower (Passiflora incarnata) (Flowering Aerials) 52 mg Catnip (Nepeta cataria) (Aerials) 52 mg Suggested Use: Shake well. As a dietary supplement, take 1 dropperful (1 mL) 1 to 3 times daily. Measure in Easy-Dose™ Dropper and put directly in mouth, water or juice, or mix with warm water to make a tea. Free of: Sugar, salt, starch, yeast, wheat, gluten, corn, soy, milk, egg or preservatives. Other Ingredients: De-ionized Water, 42% Grain Alcohol (USP Grade), Glycerin (USP Grade) and Tangerine (mandarin) (Citrus reticulata) Oil. Warnings: Caution: Due to its relaxing effects, avoid driving or operation of heavy machinery following consumption of this product. Not to be used by pregnant or lactating women unless recommended by your healthcare practitioner. Keep out of reach of children. Disclaimers: This statement has not been evaluated by the FDA. This product is not intended to diagnose, treat, cure or prevent any disease. 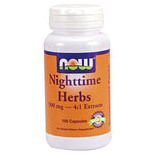 Nighttime Herbs Extract – Herbal Liquid Formula for Nighttime Nighttime Liquid Extract is a pleasing combination of herbs formulated for those who prefer an herbal beverage in the soothing evening hours. These herbs, gathered from Polynesia, Europe, and America, have been revered for centuries. Supplement Facts Serving Size: 2 Droppersful Servings Per Container: 37 Amount Per Serving % Daily Value Total Carbohydrate 1.1 g <1% A proprietary blend of Kava Kava (Piperis methysticum), Chamomile (Matricaria chamomilla), Passion Flower (Passiflora incarnata), Catnip (Nepeta cataria) Hops (Humulus lupulus), Valerian (Valeriana oficinalis), 1.6 mL Suggested Use: As an herbal dietary supplement, take 25-50 drops (1/4-1/2 tsp) in tea or directly on the tongue, preferably in the evening. Other Ingredients: Distilled Water, 20% Vegetable Glycerine and 20% Grain Alcohol Warnings: May cause drowsiness. Do not drive or operate heavy machinery following consumption of this product. Not intended for use by pregnant women or children. Herbal Relax – Herbal Liquid Formula, With Kava Kava Supports Relaxation for the Whole Body. Supplement Facts Amount Per Serving % Daily Value Kava Kava (kavalactones) 40% Passionflower (passiflorine) 3.5% Suggested Use: Shake Well. Use 1 teaspoon (5 ml), up to 3X daily. Maybe taken with or without water or juice. Not for extended use due to Goldenseal content. Other Ingredients: Oatseed-Milk Stage (Avena Sativa), Skullcap flowering ariel (Scutellaria laterifolia), Schizandra (Schizandra chinensis), Milk Thistle seed (Silybum marianum), Hawthorn berry (Crataegus spp), Red Clover flower (Trifolium pratense), Rosehips fruit (Rosa spp), Ginger rhizome (Zingiber officinale) in a base of Purified Water, Brown Rice Syrup, Honey, Natural Flavor and 18% USP Alcohol. Warnings: US FDA advises that a potential risk of rare, but severe, liver injury may be associated with kava-containing dietary supplements. Ask a healthcare professional before use if you have or have had liver problems, frequently use alcoholic beverages, or are taking any medication. Stop use and see a doctor if you develop symptoms that may signal liver problems (e.g., unexplained fatigue, abdominal pain, loss of appetite, fever, vomiting, dark urine, pale stools, yellow eyes or skin). Not for use by persons under 18 years of age, or by pregnant or breastfeeding women. Not for use with alcoholic beverages. Excessive use or use with products that cause drowsiness may impair your ability to operate a vehicle or heavy equipment." Disclaimers: This statement has not been approved by the Food and Drug Administration. This product is not intended to diagnose, prevent, cure, or treat any disease. You are currently browsing the archives for the Stress Relief category.